Your support and generosity for our Raise Craze fundraiser was overwhelming—THANK YOU!! We hope that this has been a meaningful and worthwhile experience for you and your family. The final numbers are in and we couldn’t be more thrilled! Some of the acts of kindness / community service the students performed were: volunteer at the Frazee Center, babysitting for free, performing at several nursing homes, painting the outside of Greenville Wordsmith’s wordmobile, signing up to volunteer for Fall for Greenville, volunteering at SOS Thrift Store, collecting canned goods for local food banks, collecting items for the Greenville Humane Society and so much more! 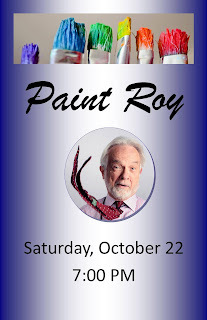 Watch for information on our upcoming "Paint Roy" evening on October 22nd to celebrate meeting our goal. Thank you for your unwavering support of our students, our school, and our community! Join FAC faculty, staff, students, and alumni as we “Paint Roy” on Oct. 22 at 7:00 pm. Students who have volunteered in the community service projects for Raise Craze will have the opportunity to “Paint Roy”! Yes, Roy has volunteered to allow himself to be painted, clothes and all. We will have local artists painting Roy’s face, and students who have met our goals for Raise Craze will earn the chance to paint Roy’s hair, clothes, etc. If you would like to join in the fun, anyone attending the October 22 celebration will be able to purchase additional articles of clothing to paint and add to Roy, and then have your picture taking with your “Roy creation”. Help us make this a fantastic fundraiser and celebration of our students' community service!